Crinkle Crags at 859 metres (2818 feet) forms part of two major rings of mountains surrounding the valleys of Great Langdale and Upper Eskdale. Crinkle Crags as its name suggests has a summit ridge of a series of five rises and depressions (crinkles) that are very distinctive from the valley below. The ridge includes a steep declivity called the Bad Step and can be by-passed quite easily. The second crinkle from the southern end called Long Top is referred to as the true summit. 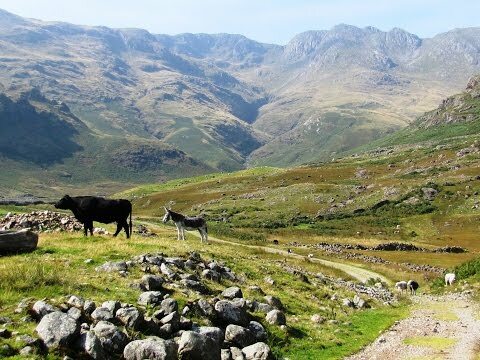 The wonderful views look across Great Langdale, Eskdale and Dunnerdale, with the estuaries of the rivers Duddon and Esk as they enter the Irish Sea. There is also a good view of Scafell Pike which lies four kilometres to the north-west. The northern most crinkle called Gunson Knott falls steeply to the depression of Three Tarns, which takes its name from a number of small pools, and separates Bow Fell from Crinkle Crags. The rocky outcropping of Shelter Crags can be quickly reached from here which provides extensive all round views. There are a variety of routes directly to the summit of Crinkle Crags but most people climb it from Great Langdale and often together with all or some of the adjoining fells of Pike of Blisco, Cold Pike, Bow Fell and Rossett Pike to make a high level ridge walk which takes in the whole of the high ground at the head of Great Langdale. Great Knott at 696 metres (2,283 feet) which rises from Red Tarn is classed as a Nuttall and generally included as part of Crinkle Crags. Red Tarn is a very small tarn situated below Great Knott in the dip between Pike of Blisco and Cold Pike. Hell Gill is a deep gully that can be ascended from Oxendale Beck in the Oxendale valley or descended from the Three Tarns in the depression between Crinkle Crags and Bow Fell. We turn right out of the car park and walk down the road and when the road turns sharp left we head forwards through the gate and follow the track to Stool End (farm). After going through the gate at the other side of the farm we keep heading forwards with the wall on our left. We make our way along the path to Oxendale Beck and cross over the bridge. We bear right and follow the path uphill towards Brown Howe. We start to follow close to the Browney Gill on our right towards the dip on the skyline. At the dip the path levels out and we keep heading forwards to Red Tarn. We then retrace our steps for about 100 yards to take the distinct path uphill towards Great Knott and just keep following the path making our way to Crinkle Crags. We then keep following the cairns up and down over the tops of Crinkle Crags (but keep to the left side of Bad Step) until we arrive at the Three Tarns. We now turn left downhill and after a short way we cross over the stream and follow the path steeply downhill keeping to the stream on our left to Hell Gill (a steep gully). At the bottom of Hell Gill we cross over the stream then head forwards with the stream on our left and keep following the path downhill. We cross over a footbridge and now follow Oxendale Beck on our right passing the footbridge we crossed on our way up at the start of the incline to Brown Howe and then retrace our steps to Stool End farm and the car park at Dungeon Ghyll. This is a hard walk on distinct paths and tracks with steep inclines and declines. Some scrambling is required. Approx 8.5 miles allow 4½ to 5½ hours using OS Explorer Map OL6, The English Lakes, South-Western area.